Welcome one and all to our final post about the 4 most popular service dog breeds! We’ve already discussed the Lab, Golden Retriever, and the German Shepherd, so we’ll rap up our series by taking a look at the Standard Poodle. While these dogs are not quite as common as our other breeds, they are growing in popularity as guide dogs, mobility dogs, and psychiatric service dogs. Because Poodles do not shed, they can be the answer for people who could benefit from the help a service dog provides, but who have trouble with dog allergies that make most other dog breeds impractical. Most of us don’t really associate the Poodle with work of any kind. We think of fluffy dainty lapdogs instead. Standard Poodles are the largest of the Poodles, and they were originally bred to hunt and retrieve water fowl. They are energetic, intelligent dogs that love training and working with their people. Aside from service dog work, Poodles enjoy dog sports like agility and rally. They also make wonderful family dogs for people who want an active companion to share life with. Poodles have style, but there’s a lot of substance there too! They are among the most intelligent and trainable dog breeds to be found. This, combined with their innate curiosity, makes them very dependable and easy to train. These qualities made them popular circus dogs when such things were more common, and today they are valued for service work. 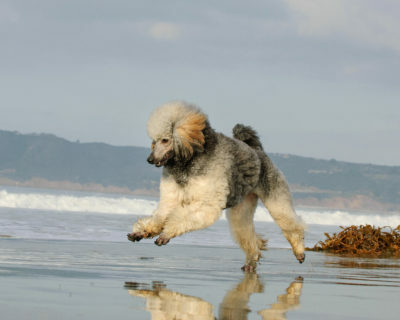 Poodles appreciate mental challenges and lots of physical activity, and they absolutely love retrieving. They tend to adjust well to most environments, enabling them to remain focused either at home or in all kinds of public places. These dogs are friendly, but not overly exuberant or stimulated by unknown people or animals, making it easier for them to remain focused on the job at hand. Standard Poodles are gracefully built with a round head and elongated muzzle. Their coats can be either course and curly or soft and wavy, and they come in any solid canine color. The most common colors are white, black, and silver. They have long legs, which makes this breed fast and agile. When fully grown, Standard Poodles stand around 18 inches high and weigh between 55-65 pounds. These are exceptionally smart, loyal, loving dogs with a strong work ethic and lots of stamina. Poodles are adaptable and curious, eager for lots of mental stimulation and physical exercise. They especially enjoy running, swimming, and games of fetch. They crave company and companionship and are happy to give it to their humans in return. While some dog breeds are known for bonding strongly to one person, Poodles tend to bond with the entire family. They are excellent with children. Poodles do best in homes with active handlers that can give them a lot of work and exercise. Without training and attention, these dogs can become destructive and vocal. Poodles don’t shed very much, and they are considered a hypo-allergenic breed, but their coats can be rather high-maintenance. They require frequent bathing, clipping and brushing, and usually need the services of a professional dog groomer to help them look and feel their best. Some groomers give discounts to their service dog clients, but the cost of Poodle coat care is important to consider. Standard Poodles can live up to 15 years if kept at a healthy weight, fed a nutritious diet, and given regular veterinary visits. Common health problems for this breed include skin allergies, cataracts, and hip dysplasia. If you want a medium-size, intelligent dog that is loyal and loves to work, the Standard Poodle is a good breed to think about. This is especially true for people with severe allergies to dog dander. This breed does require more maintenance than most breeds used for service work. If that isn’t an issue, Standard Poodles can make wonderful partners for a lot of handlers.